The i-MiEV can be driven for 150km on a single electric charge, according to Mitsubishi. Mitsubishi Motors Corp. will build 9,000 units of its i-MiEV electric vehicle along with its sister models, the Peugeot iOn and Citroen C-Zero, during its current financial year, which ends March 31, 2011. The company said it plans to export 5,000 i-MiEVs, including models built for PSA/Peugeot-Citroen SA, during the time period. The remaining 4,000 will be sold in Japan. Production will increase to 18,000 for 2011-2012 and 40,000 for 2012-2013, a Mitsubishi spokesman said. The battery-powered minicar is expected to arrive in the United States in late 2011. The Japanese automaker last week began production of its European-spec i-MiEV, along with the iOn and C-Zero, at its factory in Mizushima, Japan. 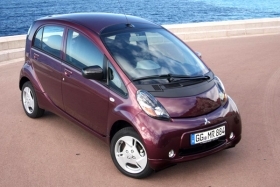 Mitsubishi has been building and selling the Japan-spec i-MiEV since last year. The European-spec i-MiEV will be sold in 14 countries including Germany, France, the UK, and Spain, with sales starting in December. Mitsubishi said new features it added to the i-MiEV for the European market include electronic stability control and a different front and rear bumper design, as well as a re-arranged center stack for an improved interior feel. The Mitsubishi spokesman said it is too early to predict the breakdown of the projected retail versus lease sales of its i-MiEV in Europe, but he said that fleet sales are expected to be higher than private sales shortly after its launch. The i-MiEV will sell for 30,000 euro to 35,000 euros (about $41,900 to $48,900) before government incentives, which will lower the price below 30,000 euros depending on the size of the incentives offered to buyers.